There are 3 different transition collars available for the slide valves - 90°, 45°, and 30° angles. (See Accessories on page 18.) The new style collar allows easier attachment to the bottom cone with little or no cutting necessary. 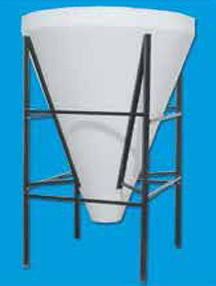 Our slides feature a galvanized plate and guide system. 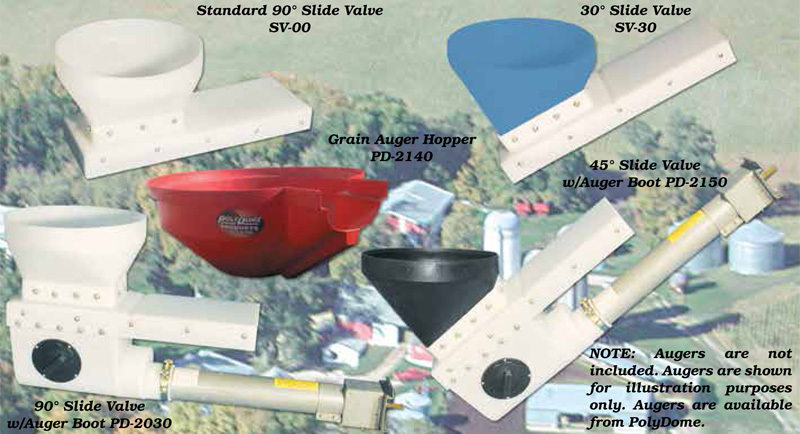 Our auger boots will attach to any of our slide valves and handle 4” or 6” augers. The auger boots have a clean out access cover. It is recommended that you use a concrete pad at least 5-1/2" thick for our 4.5 ton thru 8.5 ton units. .5 30 24 78" 52" 180 lbs. .75 47 37 9' 68" 300 lbs. .8 40 32 10' 10" 50" 300 lbs. 1.5 75 60 9' 6" 74" 470 lbs. 2.5 130 104 11' 5" 74" 500 lbs. 3.5 180 144 13' 5" 74" 540 lbs. 4.5 220 176 12' 6" 96" 800 lbs. 6.5 325 260 16' 96" 850 lbs. 8.5 425 340 19' 6" 96" 950 lbs.